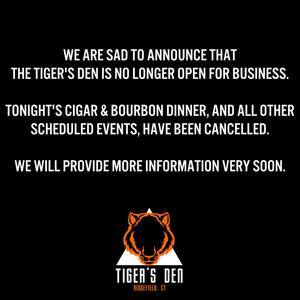 Joe Attonito, the owner of Tigers' Den, announced on his business Facebook Page that Tigers' Den is no longer open for business. The Cigar and Bourbon dinner, planned for this evening, will not take place. He shared some details about his difficult decision to close his sport's bar on Ridgefield CT and Hello Ridgefield Facebook Pages, "I guess this is goodbye, Ridgefield. After almost 4 years of mediocre sales and business my debt has caught up. So people are clear, I was behind on taxes with the town (as well as other debt that has accrued) and made a payment late last night. The town wanted the payment by 4:30, and having taken the day off to spend with my daughter I made the payment in the evening but was told it was too late." Attonito went on to say, "I wanted to thank each and every one that gave The Den a chance, whether you were a regular or a one time customer, loved us or hated us, you were a part of me. You were all a part of my effort to make a place great, and I guess I just fell short. I will land on my feet, get a job, make money, pay debt, mend fences and plan on opening a restaurant again in the near future. Until then, friends, please keep in touch!" Last week, we featured Tigers' Den in our Why Small Businesses Matter series. He told us that starting a restaurant was something he had always dreamed about, even as a young child. "When I was 14 years old I started working as a busboy in a catering hall. At 21 I managed a multi-million dollar restaurant and basically never looked back. I fell in love with the business of restaurants. I craved learning...about food, drinks, service...how to fix broken equipment, how to mix flavors...whatever I could learn I did (and I still am to this day). When the opportunity to own my own place arose I jumped at it, and am very grateful to be in such a wonderful community," he said. Small businesses matter - a lot! Thanks, Joe for bringing good things to Ridgefield and for being a gathering place for locals.